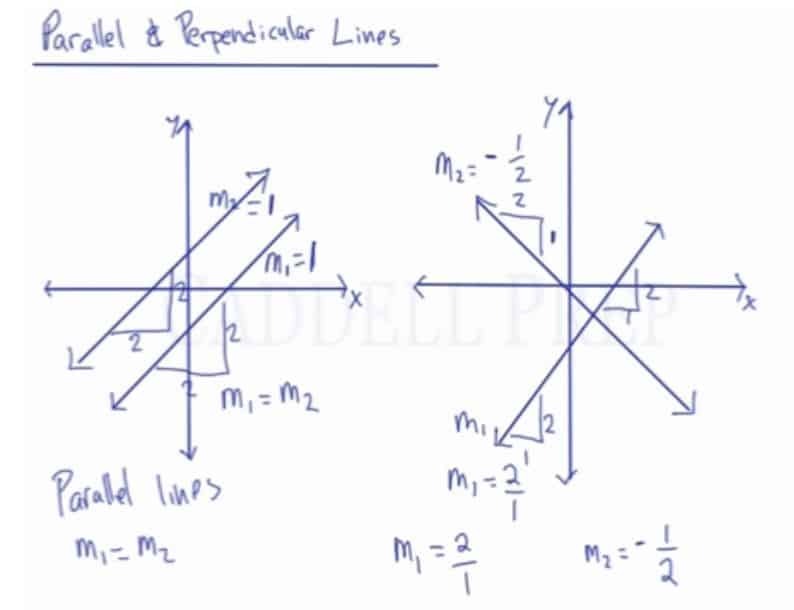 Learn about the relationship between parallel and perpendicular lines. Parallel lines have the same slope but different y-intercepts. Ex: and are parallel. Perpendicular lines have slopes that are the negative reciprocals of each other and may or may not have the same y-intercept. Ex: and are perpendicular. Let’s go over parallel and perpendicular lines. We have two graphs each with a line. The one on the left side has a positive slope. The line is going upwards from left to right. If we draw a line parallel to it, it would look something like this. If the first line is going to run over and rise at , then the second line will show the same exact rate. So, if the slope of the first line is and the slope of the second line is , we can say that . So if then we can say that . Now, let’s look at the second graph. Let’s say that this line is over and up , the slope here is . Now if we draw a line perpendicular with this, it will look something like this. The thing with a perpendicular line is that it goes the other way. If the first line is going up, then the perpendicular line goes down. If one line has a positive slope, then the other line has a negative slope. Now if the first line over and up , the perpendicular line is going over and down . Let’s look at these closely. These two slopes are the negative reciprocal of each other. Therefore, in parallel lines the slopes are equal . While the perpendicular line is the negative reciprocal of each other.